Do you love this pot or think it’s ready for the trash? It took me a long time to accept this sort of imperfection. The Japanese have a name for it. They call it “wabi sabi.” The nearest that I can come to understanding the concept is to describe it as lived in or lived with. I have heard it described as “imperfectly perfect ” but that doesn’t help me. So what do you think? Would you keep this pot around? It’s one of my favorites. I guess I like imperfection. Where can I buy an osmanthus without driving to my sister’s home in South Carolina? Thanks for the comment–and for reading. 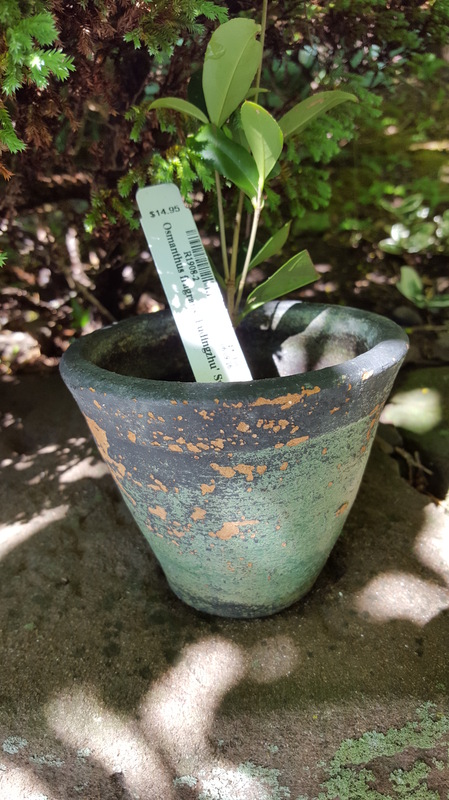 If you don’t mind small plants–they grow, although as an evergreen, they grow a little more slowly than some other plants–a great site for all kinds of unusual plants is exactly where I got this plant–Logees Greenhouse in Danielson, CT. They ship all over the country and they pack very carefully. Their web site is http://www.logees.com. I must have ordered from them 10 times this summer–at full price. I get nothing for the recommendation!